Another time traveling Halloween visit. This time we go back to 2007, when we were a very busy and creative family. Very busy… recovering from Firestorm '07, evacuation, and the usual domestic perils, but nothing could deter Alex and William from their ingenious pumpkin carving plans: To re-create El Fauno, from Pan's Labyrinth. William found an image of El Fauno, and using a "threshold tool" on Photoshop he divided the image in to black and white, strongly contrasting the key features of the image. 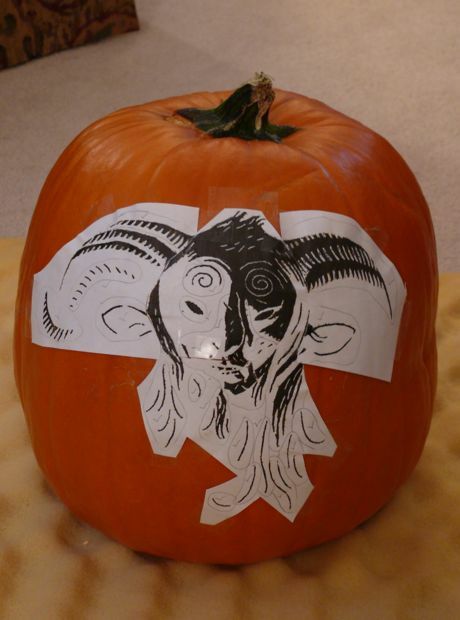 They printed the El Fauno pattern and then taped it to the pumpkin. The next step involved transferring the pattern to the pumpkin… this job was shared between William and Alex, and it took several different approaches before they struck on the best method. They tried poking throughout the pattern to make a pinpoint outline, but the image had so many details that they also resorted to freehand drawing directly on the pumpkin. Once they could see the image outlined on the pumpkin, they took turns carving away the darker sections, which then become the lighter part of the face. The part that is not carved becomes the darker part of the face. This part is hard, rather tedious work. They had to be very careful around the fine details... too much force could lop off a key feature. The frustrating part is they were relying on inadequate tools... kitchen gadgets and knives. I distinctly remember thinking how much easier it would have been with better tools, like linoleum cutters, wood carver's tools etc. 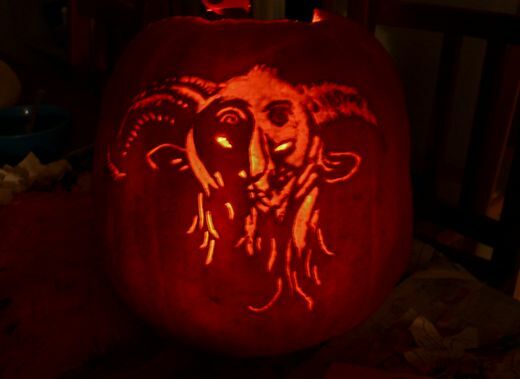 El Fauno's eyes were the only part that were opened all the way through the pumpkin. The rest of the pumpkin is scraped as thinly as possible, without actually breaking through. This allows the flesh to glow when lit from within. And it's the glow that really brings the effect to life. It also helps to step back. We realized that close-up scrutiny of the subject can give the appearance of a failure, because the success is not in the details, but in the Impressionism of what is there, and not there. I am impressed. They made this haunting figure an exceptionally memorable one. Wow, that's amazing! Your family is so amazing. I love to hear your stories. It's even better when people share the fun. Total craftsmen. That is one bitchin' pumpkin. I can imagine they didn't put in that much effort this year... :) Give 'em my congrats, retroactively! Amazing! I love it - wish I'd seen it before I started on our own effort, created with blunt knife and rather underripe pumpkin here in Spain. They are just beginning to go for Halloween but haven't grown the pumpkins big enough this year. Will have to grow my own for next. I can't imagine staying focused long enough to do such a piece of work...so well done to them!